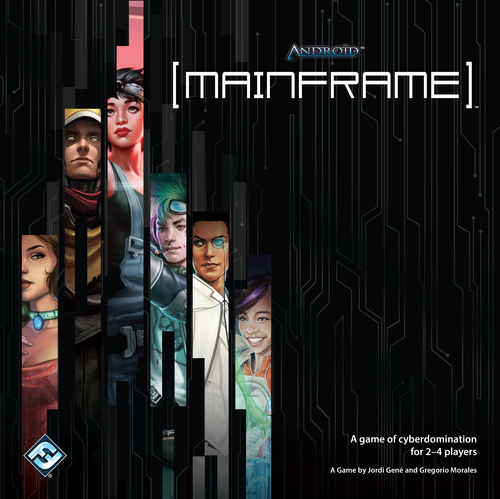 Android:Mainframe is the fourth game that I know of set in the mythical dystopian Android universe, a creation from the imaginations of the folks at Fantasy Flight – the other games being Android, NetRunner and Infiltration. It is the future. Mankind has spread itself out across the solar system with varying degrees of success. The Moon andMars are colonized. A plan to terraform Mars is well underway, hindered only by a civil war that has broken out on that planet. On Earth, a massive space elevator has been built, stretching up into the sky. It is the hub of trade in the solar system, and most people refer to it as the “Beanstalk“. Computers have continued to advance, and that, combined with discoveries in the field of neurobiology, has led to brain-mapping, a method by which a human mind can be stored electronically. Recently, two rival megacorporations have used this development in different ways to create artificial, sentient life. Jinteki created human clones that can be matured and educated in the fraction of the normal time. Haas-Bioroid, on the other hand, built robots with brain-mapped, artificially intelligent minds, calling them “bioroids“. Naturally, this has caused no end of trouble. With both companies selling their artificial humans, or androids, as cheap labor, thousands of already-impoverished humans have found themselves unemployed. This, combined with their deep mistrust of scientists playing God, has led many lower and middle-class citizens to hate and fear the androids. A group calling itself Human First has sprung up, calling the androids “golems” – referring to the legendary soulless clay creatures. Human First has attacked the androids on numerous occasions, usually wielding sledgehammers as their weapon of choice, since the androids are often physically resilient. In this hotbed of hatred, fear, and prejudice, the men and women of the New Angeles Police Department attempt to maintain order. Their job isn’t easy, since their charter requires them to patrol not only New Angeles, but also the Heinleinmoon colony located across the Beanstalk. Nevertheless, they continue to guard the thin blue line between civilization and anarchy. Meanwhile, the all-seeing, all-knowing Network spreads through the whole fabric of human existence, spanning the breadth of the solar system, and serving as a repository for the best of all human learning. It’s also the home to the world’s greatest and most valuable secrets, which megacorporations seek to bury in distant corners, shielded by layers upon layers of defensive protocols known as ice. But since the network can be accessed by anyone, anywhere, it’s also the greatest vulnerability these colossal megacorps all share. Welcome to the Android Universe. So, in this universe, Mainframe is set. Four elite cybercriminals known as runners who are competing for control of a vulnerable bank’s various accounts. 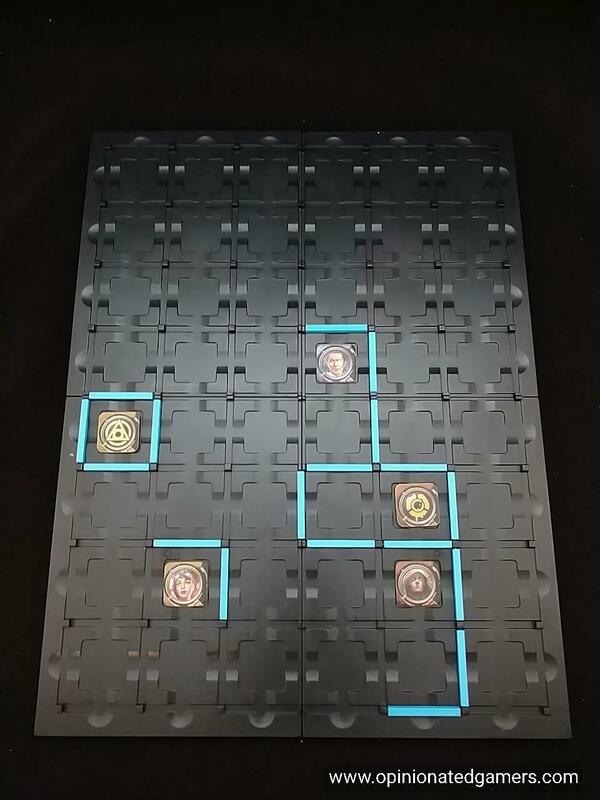 The Mainframe is represented by a plastic board, made of four pieces which is assembled by the players, forming a 6×8 grid of spaces. Surrounding each of the spaces are grooves for plastic partitions. There are six different runners in the game, and each player chooses one of them to play. Each has a unique set of 5 Program cards, specific for that character. These are shuffled, and each player is dealt three of them for the game. The undealt (and unchosen) cards are returned to the box. 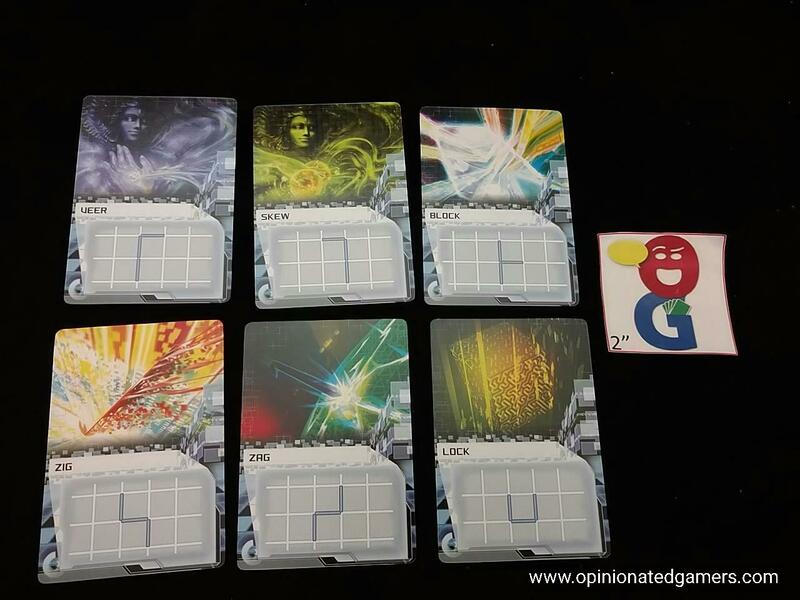 There is a separate deck of 45 Generic Program cards. These are shuffled and then four are placed face up next to the board to form a supply. Each player picks up the eight access point markers corresponding to his character. The game starts with each player placing one of their access point markers down in any open space. The generic programs of a few different sorts. Some allow you to place any two partitions, some allow you to swap access point markers, while others allow you to place three partitions in the exact orientation shown on the card. Unique character program cards all themed to the particular character. Each unique card is only used once, and once played, it is kept in a personal discard pile next to the player who played it. As the six different characters have different abilities, you should make sure to tailor your strategy towards the strengths of your unique cards. The goal of play is to enclose areas on the board with partitions such that only your access point markers are found within that area. Once that occurs, the zone is considered to be secure – and the partitions along its exterior can no longer be moved nor can any of the access point markers be altered within. Essentially, the entire area is no longer active in the game. Nothing can happen with any of the contents or space within. To show that an area is secure, flip the access point marker over to the reverse side to denote this. Note that an enclosed area which has markers from at least two players in it is not considered secure. The walls can still be moved or the area can be further subdivided with subsequently played partitions. If at any time an area becomes secure, even if it’s not owned by the active player, the access point markers within the newly secured area are flipped over and the walls and contents become fixed. Again, the game ends when either the generic program stack is exhausted or no programs can be legally executed (that is, all players pass in succession). At this point, you move to the scoring phase. To score, you simply look at all of your secure zones. Each access point marker in a secure zone scores a number of points equal to the size of that secure zone. It may be easier for people to score if all non-secure markers are removed from the board prior to calculations. This is a remake of an older game, Bauhaus, published in 2013. The game has been jazzed up a bit with the addition of the unique power cards. This was a way to add in the characters from the Android universe into the game, and I think it helps give a bit of flavor to an otherwise dry abstract area control game. It remains to be seen whether or not the six sets of cards are balanced against each other… In my games thus far, there are a few colors which I certainly prefer to play based on the actions, but that may just be because they align with the strategies that I’ve developed in my initial plays. I’ve certainly already learned that you will likely do better learning what your special cards do from the start of the game, and try to set up plays to take the most advantage of your unique abilities for that game. The game plays rapidly – on average, players will only get 12 to 15 turns in the game. 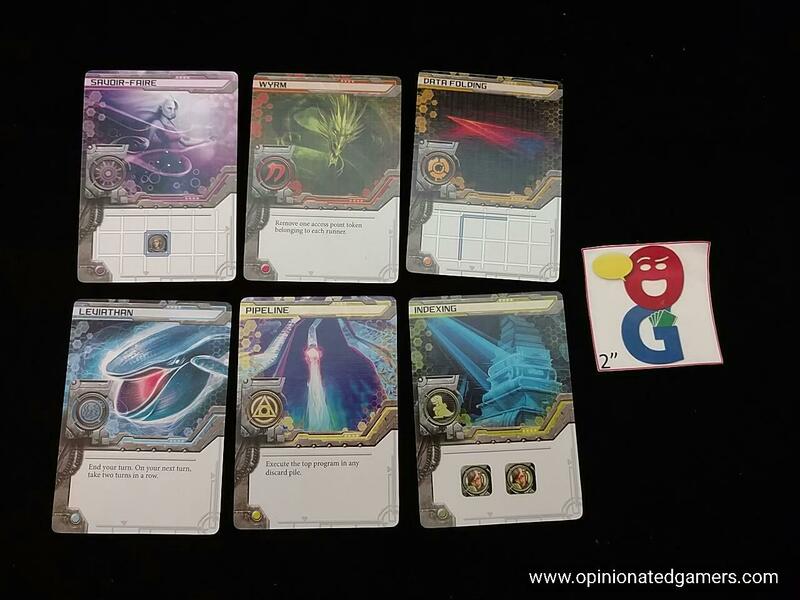 Seeing that you will have to spend at least a few turns burning cards from the deck in order to place other access point markers on the board, you will probably really only end up with 8 card plays in the game. Knowing that, you really have to make the most of them when you can, and if you don’t have a great card to play, you might be better off using that turn to place an access marker to the board. After all, you can’t score points with markers unless you’ve placed them on the board! The basic actions are pretty simple, and sometimes the best play is to simply be lucky and have the right card come up when you need it to close off an area. Otherwise, it’s waiting for the right time to use your unique cards (which possibly your opponents are unaware what they might contain) to take advantage of the board situation. Despite the unique cards, the game retains most of its dry abstract nature from its predecessor. 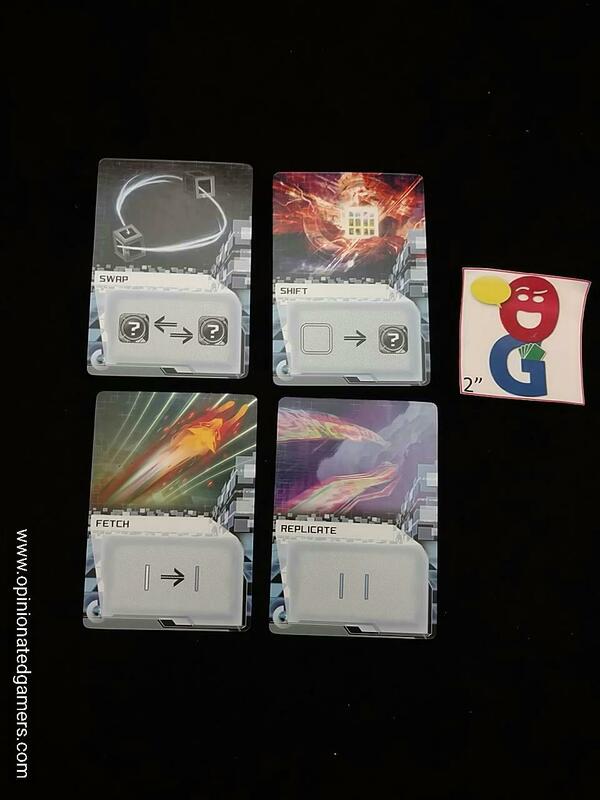 Action moves slowly as you are generally only able to take one action per turn, and you generally cannot place both an access point marker AND partitions on the same turn. As a result, you have to set things up on a more long term basis, and you have to wait for every other player to take a turn before you can build on your previous action. In my initial games, my best successes have not come from my insightful play but rather when the board situation was left to me in an advantageous position – either from an oversight on their part or because they were able to make their own play, and it just so happened to leave an opportunity for me to take advantage of. Mainframe is a game that I’d be happy to play if asked, but it’s a bit too dry and abstract for my tastes to have it be a regular visitor to the game table.